This weekend (Fri-Mon), I was with erin_trying in Savannah, GA. See, I had a 4-day weekend from work, but had gone home the previous weekend, so my work would not pay for another trip home. Therefore, Erin and I decided to go to Savannah for an extended weekend, hang out with her cousin, and generally enjoy some of the South's oldest extant architecture. Plans changed a lot, but I ended up picking her up from Atlanta's Amtrak Station at 8am, had breakfast, and then went to Savannah. We checked in and chilled (very necessary after long scary rainy drive) in the hotel room before heading to dinner with Erin's cousin. The next day we drove to get Erin a massage. On the way we stopped at the sketchiest gas station I've ever had the pleasure of patronizing and got lost, but recovered to get her there less than 15 minutes late, which is not bad for one's first day in a new city, I think! We had a very late breakfast at IHOP and went to a(n?) historic house, which was pretty neat. We saw a hip-hop community rendition of Romeo and Juliet put on by a local non-profit, focusing on getting kids out of trouble through hip-hop, poetry, dance, and art. Sunday we did some more touristing, and feasting. 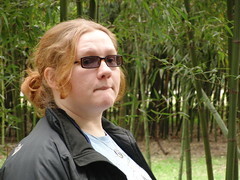 Including going to the local bamboo nursery. erin_trying was ultra cute there, as she is everywhere. Oh yeah, and we saw the Super Bowl with Erin's cousin and some of her friends. The game was exciting! Monday we got a call from Amtrak saying that Snowpocalypse 1 was causing all trains leaving Georgia to be cancelled, so we hit up the internet and bought her a ticket home from ATL airport. It meant we had to leave Savannah early, but we still had time for a tasty brunch there. Then I parked at ATL to have linner with her, and away she went. Flying was a lot more pleasant for her than taking the train, it sounded like. In American English, "a historic house" because "historic" starts with a consonant. In British English, "an historic house" because "historic" starts with an unvocalized consonant. At least that's my understanding of it.